The Ausangate mountain trek is the most representative mountain of Andes. It is located to 6,372 meters height (20,900 feet). 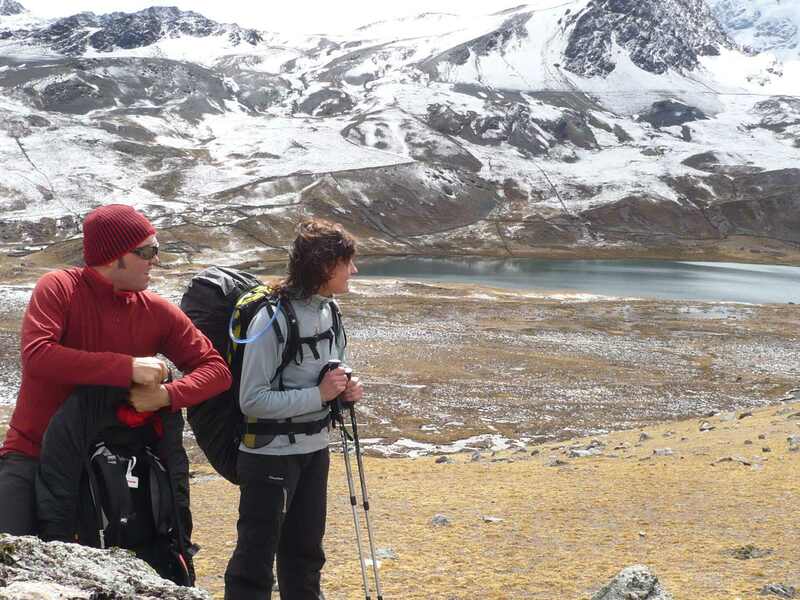 The Ausangate trek takes its name from the Nevado Ausangate. Turquoises lagoons, extensive plains and stone forest, turn totally to the zone an isolated lunar paradise. To walk by the landscapes of the Ausangate is an indescriptible adventure, in which it is impossible not to be astonished before the beauty at the dusks and eternal snows. He is frequent to also be with rock needles that rise to more than five thousand meters of height and with ice tongues that fall of vertiginous way and form glacial lagoons. Day 4: Day Hike to Quevesere Glacier. Day 8: End of the trek in the Cordillera Vilcanota and return to Cusco. 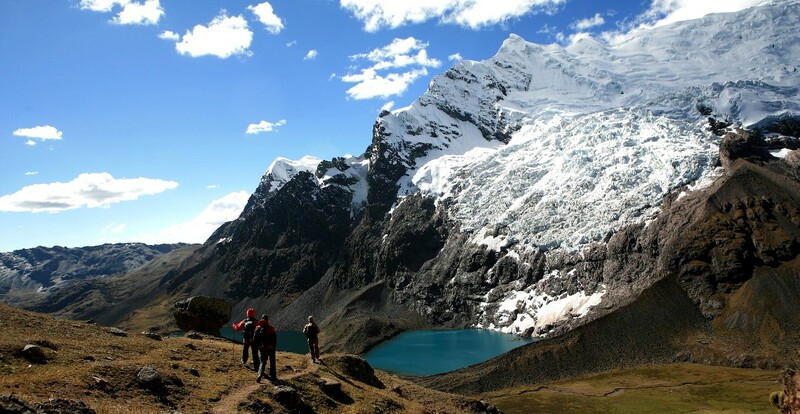 We strongly suggest staying at high altitude (above 3000 metres- in Cusco or another high altitude city) for 3 to 4 days before undertaking the Ausangate Mountain trek. This is in order to minimize the effects of possible altitude sickness. Early departure from the hotel to Vilcanota mountain range by private bus. 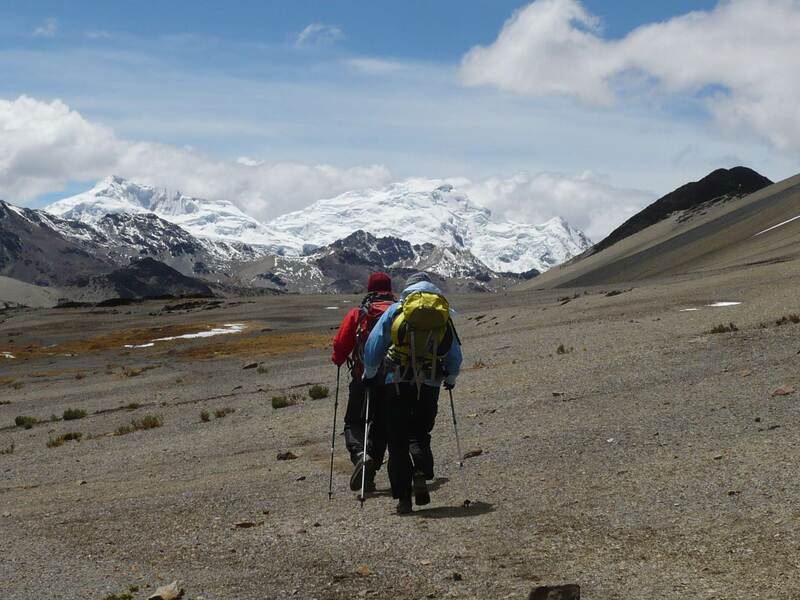 During our journey we shall go over the Pass of Ccatca (4,200m // 13,779feet), after which we will reach the towns of Ccatca and Ocongate (3,700m // 12,139feet). 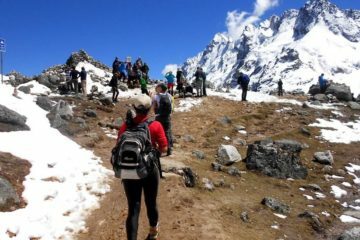 Finally, we arrive in Tinki (3,900m // 12,795feet), indigenous village. When we meet our friendly muleteers (arrieros), after introductions and greetings, we can observe some rituals of benificience with offerings to the Pachamama and the Apus. We then set forth on our trail to begin our trek. Overnight in Pacchanta (4,240m // 13,910feet) in the vicinity of the hot springs. Number of Hours on bus: 4h. Number of Hours of trek: 3h30. Long walk over the Altiplano. 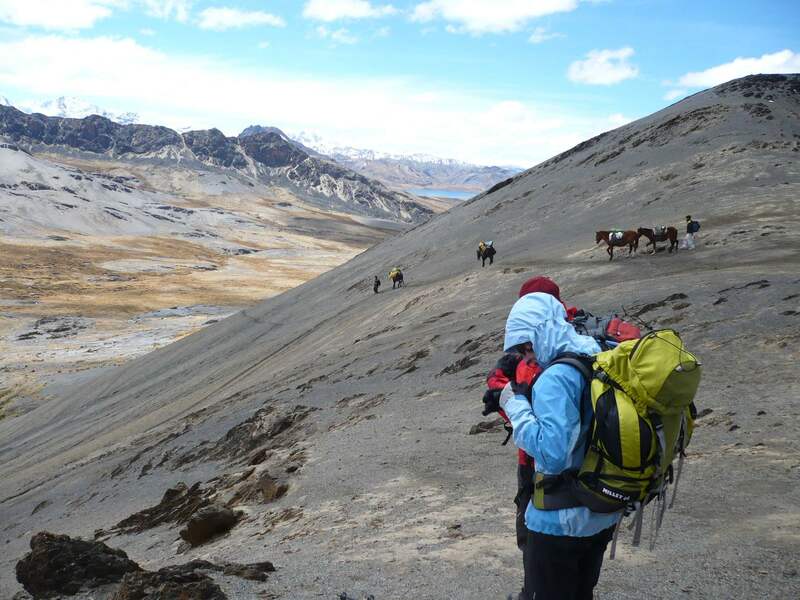 After having skirted around lake Comercocha (4,580m // 15,026feet), we advance gradually toward a pass between two glaciers, the Pass of Campa (4900 m). Overnight camping in Quilleta (4,600m // 15,091feet). We surmount the splendid Cóndor Pass, close to 5000m // 16,604feet altitude, then hike along a downward slope to Sibinacocha lake (4800m // 15,748feet), the highest lake of the entire mountain range. Overnight camping close to Lake Sibinacocha. Day of rest and a small trek toward the glacier of Quevesere. Day 5: Laguna Sibinacocha - Ajaurupuyoc (4,300 // 14,107feet). Traversing the Altiplano, this day we observe rustic houses in the communities. 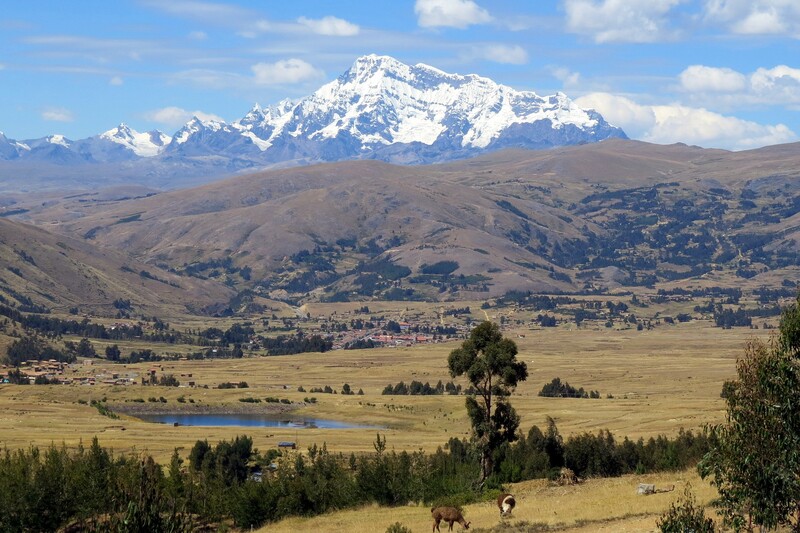 It is also the occasion to observe numerous fauna, alpacas, and perhaps some vicuñas. Overnight camping at Ajaurupayoq. Lodging: Overnight camping in tent. We cross the Pass of Palomani (5100m // 16,732feet). Overnight camping at Pukaqocha (4,550m // 14,927feet). Today’s trek takes place along the bottom of a sheltered valley. The trek is easy and we have only a light ascent to contend with. Actually, we skirt along the west and northwest slopes of our favorite mountain -Ausangate-, afterwards reaching Upis, we can camp or, instead + two hours and we can sleep in Coñamuro, close to the homes of the local inhabitants, an excellent opportunity to observe and participate in the customs and everyday life of the communal citizens. Lodging: Overnight camping in tent or in the vicinity of local inhabitants’ homes. On this day we pull away from the impressive Ausangate Massif, and trek through the highland Puna, in the company of Andean geese (huallatas) and wild ducks… Toward the northeast can be seen the Cordilleras of Urubamba and Vilcabamba. Soon we reach Tinki where our bus awaits us. 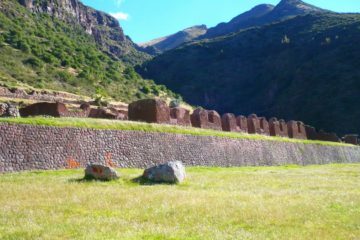 We now retrace our journey through Ocongate and on to Cusco. Late afternoon arrival in Cusco. The admission rates precluded in the program. Pack animals and Muleteers + 1 emergency saddle horse for 8 days. 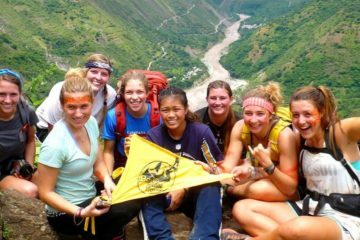 Professional and Qualified Guides, with specific Mountaineering training and instruction received in Cusco , ample experience in trekking, English and (or) Spanish-speaking. For knowledge of any other language.